This year’s Miami Beach ballot initiatives include establishing an Office of the Inspector General, leasing City-owned land for a hotel connected to the new Convention Center, and a General Obligation (G.O.) Bond. Following is a look at the Convention Center Hotel lease questions. Rent to City after Hotel opens, including greater of guaranteed rent ($16,616,242 over first ten years, adjusted thereafter), or percentage of Hotel’s revenues annually? with any amendment of such ordinance subject to supermajority (5/78ths) City Commission approval? Important note: The vote on Question #3 is for a lease on property adjacent to the Convention Center (above). It is not a referendum on the design. While concept renderings were provided as part of the lease, they are not final. The design is subject to review and approval (with all the requisite public comment) by the City’s Design Review Board. The proposed location for the Convention Center Hotel is currently used as a surface parking lot. MB Mixed Use Investment, LLC (“Miami Beach Connect”) is a joint venture controlled by local developers and Miami Beach residents, David Martin, a principal with Terra International Developments, and Jackie Soffer, a principal of Turnberry Associates. The lease agreement is for the development and operation of a privately-funded convention hotel. If this were a City-owned hotel, no vote would be needed, however, the City’s Charter “requires approval by at least 60% of the voters voting in a Citywide referendum of any lease of ten (10) years or more of certain City-owned properties located in the vicinity of the Convention Center, including the Hotel Site property that is the subject of the Ballot Question,” according to the City’s Voter’s Guide. 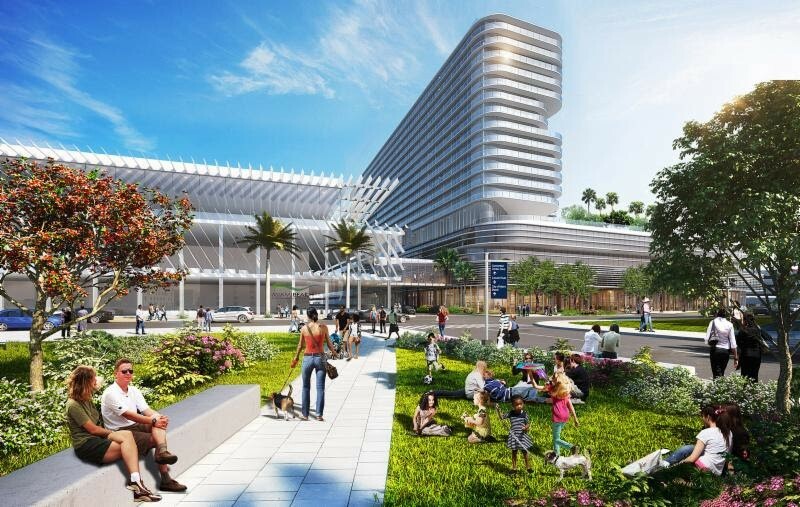 The hotel is estimated to cost $362 million to build and would be connected to the new $620 million Convention Center via a skybridge. According to the terms of the lease, it would be completely privately-funded with no City subsidies, tax rebates, or tax abatements. Miami Beach Connect would also be responsible for all ad valorem taxes, resort taxes, and other fees. Supporters, including the Greater Miami Convention and Visitors Bureau, argue that the Convention Center has mostly attracted trade shows – and local “day trippers” who drive – rather than more lucrative conventions that largely bring in out-of-town visitors who use other means of transportation to get from the airport to their hotels and who will walk to nearby restaurants. “Before its renovation, our Convention Center was 70% trade show, 30% convention – we strongly believe with an adjacent hotel with a guaranteed room block to permit the City to book convention events, that ratio will at least reverse itself which will mean much less traffic and more resort taxes for the City,” Gelber said. This is the third time the City has tried to build a Convention Center Hotel. While 54% of voters gave their approval in 2016, it failed due to the 60% requirement. After considering the height and traffic objections to the previous proposal, the developers have proposed a 185-foot hotel (the maximum as allowed under the lease), which is 100 feet less than the proposal rejected by voters two years ago. Concept rendering of proposed hotel as viewed from the soon to be constructed park across from the Convention Center. Courtesy Miami Beach Connect. One of the key questions has been how a hotel will impact the Fillmore. 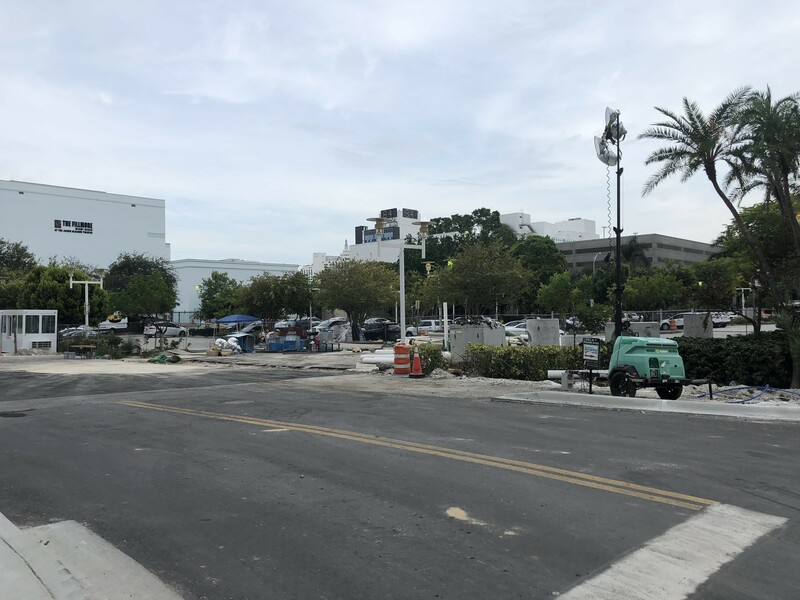 Talbert wrote, the “beloved venue and Miami Beach icon” has been factored into the location of the hotel, ensuring the “preservation and protection” of the theater. According to the City’s Voter’s Guide, the Fillmore will continue operations during and after construction of the hotel. Resiliency and sustainability measures are integrated into the design according to the developers. "It will include stormwater management and reuse, flood risk mitigation, energy efficieny and the use os solar power, and design features that ensure continuity during weather events," according to David Martin. They have also committed to achieving LEED Gold certification. The lease requires “at least 320 parking spaces” and an “approved hotel brand.” At a recent community meeting, developer David Martin said Hyatt and Hilton are on the short list. Not only can the hotel site not be used for gambling establishments of any kind, "Miami Beach Connect (or any subsequent Hotel lessee or persons with an ownership interest in lessee) cannot own or operate any gambling establishment in Miami-Dade County,” according to the City’s Voter’s Guide. Finally, the developers will contribute approximately $3.2 million to the City’s Art in Public Places projects throughout the City.